Today is the reveal for Andrew Thornton's Moon Garden Challenge. 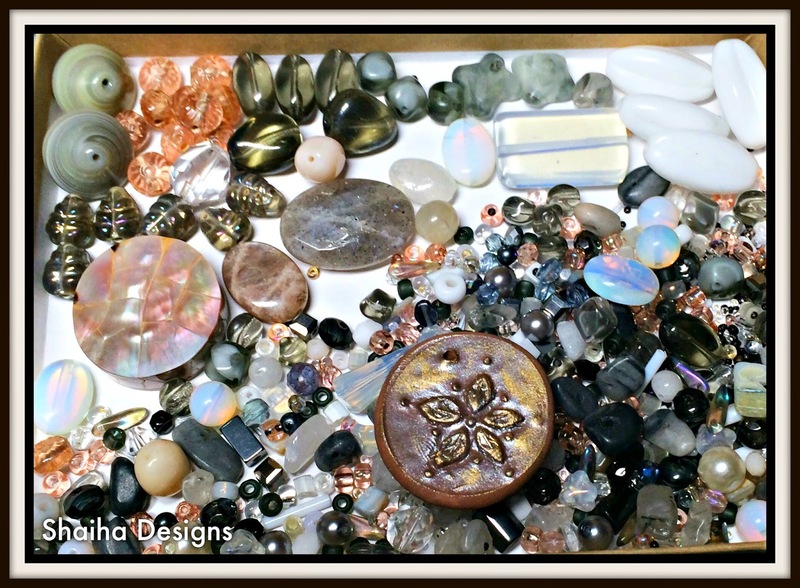 I received quite a bit of goodies all based around the colors of moonstone and labradorite. The beautiful pink gold focal with the flower stamped on it is one made my Andrew for this event. I went to town on this bracelet. The thought I had in mind was just how would a garden look on the moon? Not a lot of bright colors but flashes of color nonetheless. I added in the clasp and the black seed beads, the rest came from the wonderful goodies sent in my kit. I wanted to show of this wonderful focal. It is a pinkish color with delightful flashes of gold. And here's the finished design using that focal. The focal and the crystals are from my kit. 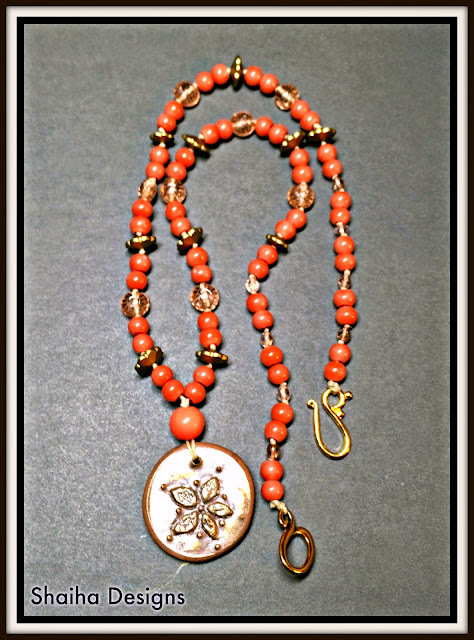 I added in some pinkish orange beads to highlight the focal also with some vintage gold sequins. It is finished off with a golden pewter clasp. To see what everyone else has made, just click here to go to Andrew's post. Beautiful, rich bracelet design! I love the density of the bracelet and the mix of beads that you chose. 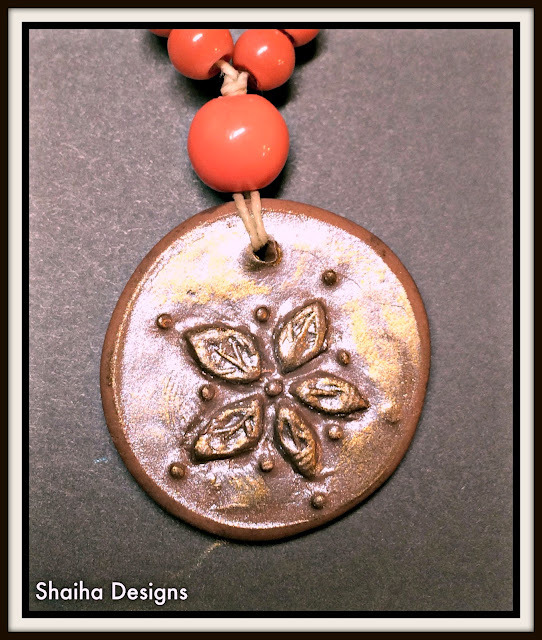 The necklace is bright and beautiful as well and the accent beads highlight the warmth of the poly clay pendant. Too lovely pieces! I love that elegant bracelet. I wish I had used that pendant but time got away from me. Love! The necklace is wonderful and you pulled and combined colors that really highlight the beauty of Andrew's pendant. I always love your bracelet designs and this one is no exception. It is like a garden on the moon! Lovely! You did a wonderful job of pulling everything together in both designs! I love the fullness and abundance of the bracelet. It has a nice visual heft... which makes it look really "expensive" to me. I hope that makes sense. It just has a nice lushness to it. And I adore your pairing of colors in the necklace. It definitely warms up the palette and complements the focal nicely! Good job! And thank you so much for your participation! Your bracelet is wonderful! 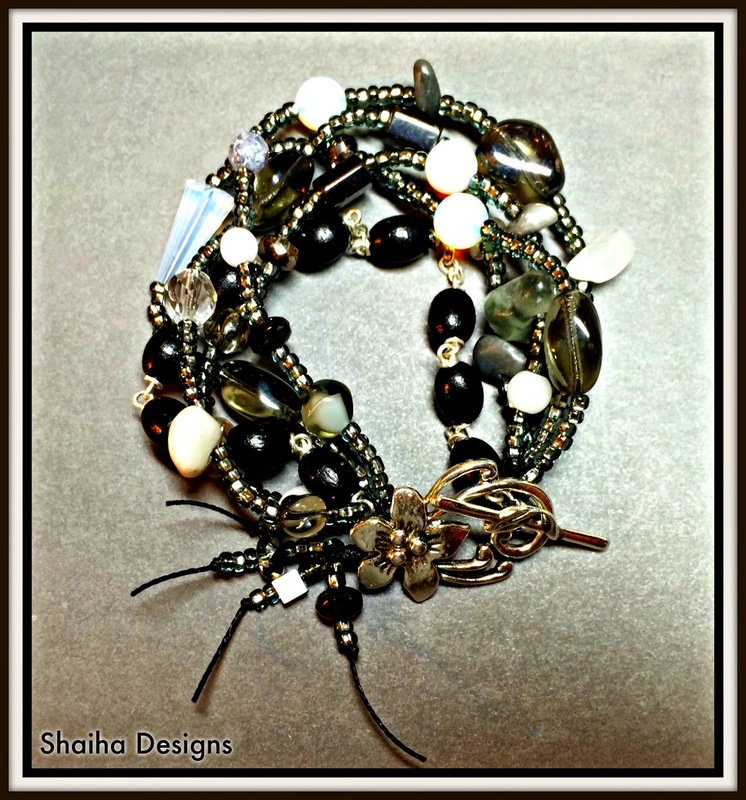 The layers of beads are so lush and work together so well. The clasp is just perfect too and continues the garden theme. Beautiful! love love love the multi-strand bracelet! You did an amazing job capturing a Moon Garden at night!